Watch the campaign’s new satirical film ‘Pat on the Back’. 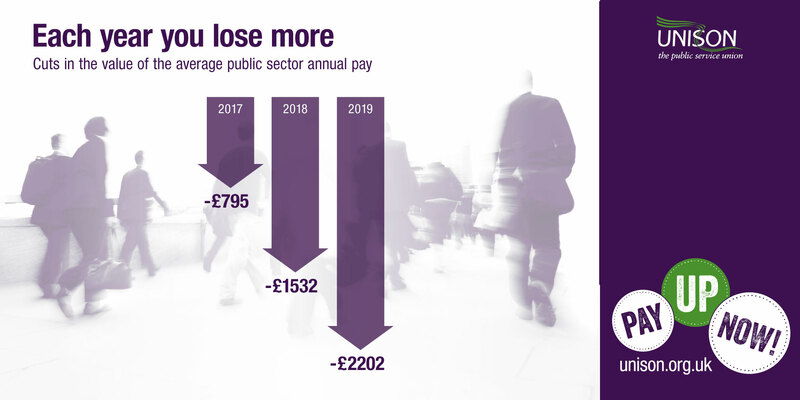 It highlights the government’s hypocritical attitude to public servants – commending their dedication and hard work, yet refusing to lift the public sector pay cap. 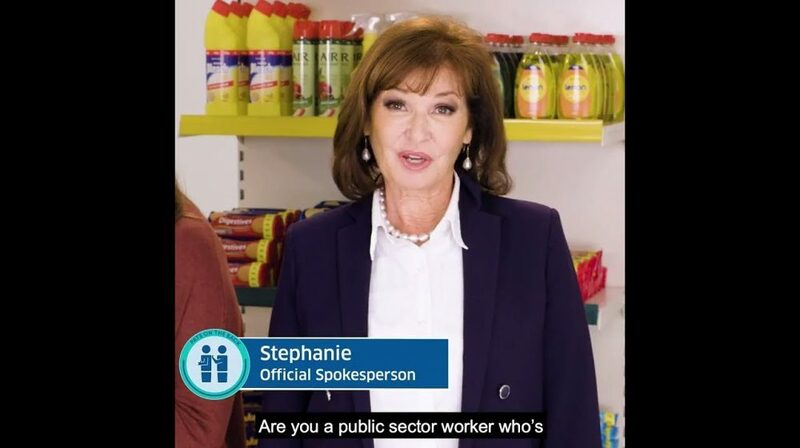 Former Dynasty star Stephanie Beacham takes up the mantel for public services. Share the Facebook film with your friends and help galvanise public opinion against this intransigent government. 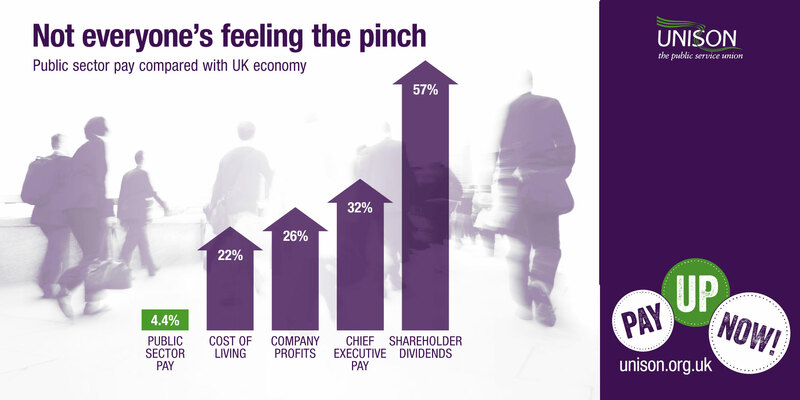 There is now real pressure to scrap the 1% cap on public sector wages and UNISON is leading the fight to get public sector workers the pay rise they deserve. 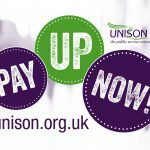 More and more people are listening and supporting our Pay Up Now! campaign. We can’t miss this opportunity. They won’t pay up if we don’t all speak up. So, please get involved in our campaign and help us win. Together we can do it. 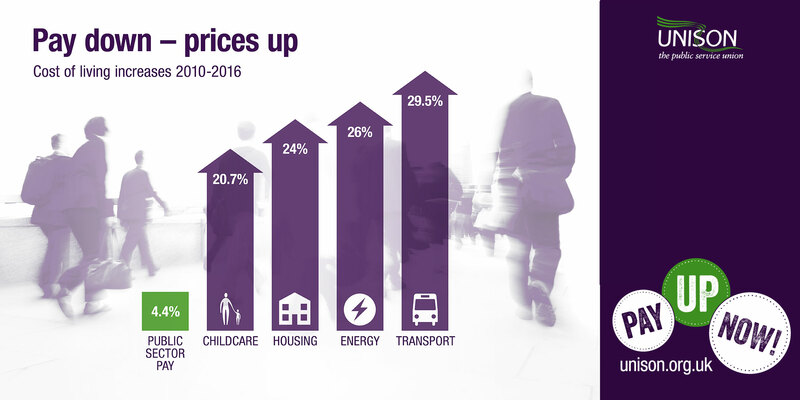 Please tell us how cuts to pay have affected you, and your family, in the last six years. Can we use your story in our communications? If you're happy for us to use your story in communications please provide a phone number in case we need to contact you and you are happy for us to do so. 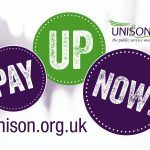 Would you like to receive updates about the pay up now campaign? You will ONLY receive updates about this campaign. University of Leicester security workers’ petition attracts nearly 1,000 signatures in days – why not add your support? 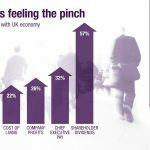 Run a pay quiz at your branch meeting – download the questions and answers. 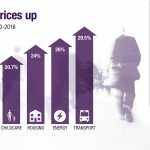 Want to blog about pay? Get ideas and help here. A good way to get people thinking about their pay – while at the same time boosting their numeracy skills to calculate percentages – is to set up a learning activity using our Payslips and Percentages pack. You could do this learning activity as part of a branch meeting, as a Lunch and Learn session or from your pay stall in the workplace. Find out more. 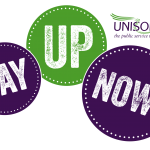 To find out more about learning opportunities with UNISON, contact your union learning rep or regional education team. Leaflet calling for the implementation of the NJC- 2018/19 pay deal in academies and urging members to campaign for their pay rise. An A4 leaflet outlining the employers’ offer on NJC pay 2018/19. England, Wales and N Ireland – excludes London. Bilingual in Welsh and English. 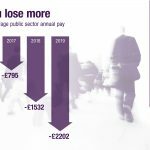 Local Government Pay Branch consultation January 2018. For council and school workers. 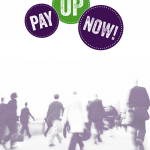 A4 Pay Up Now poster for Scotland only. Large Pay up now placard for use at pay rallies and demos. This does not include the scrap the cap hashtag. Does not come with sticks. Pay up now t shirts. Cost will be dependent on quantity orderedt including postage and packing.You will need to order these from TC Branding 01844 27500 quoting stock number SML 933 Please specify size and quantity and a delivery address. 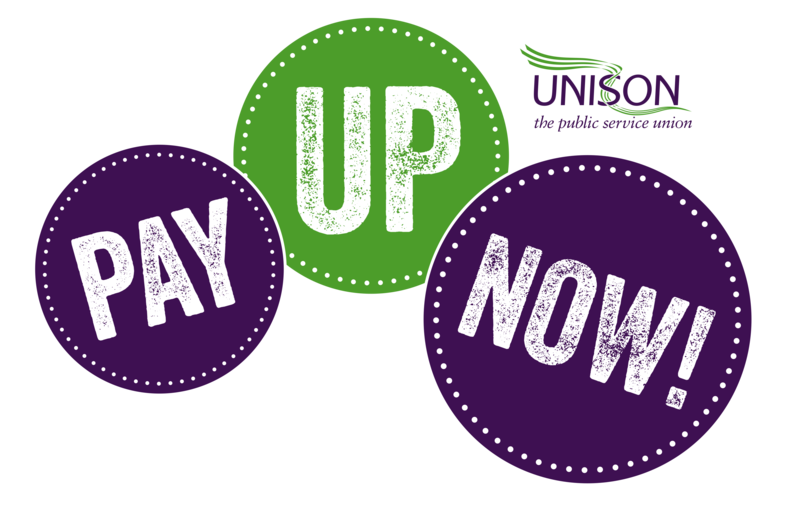 Pay up now stickers to use at pay events and rallies or in the workplace. 15 stickers per sheet. Please order number of sheets, not stickers. 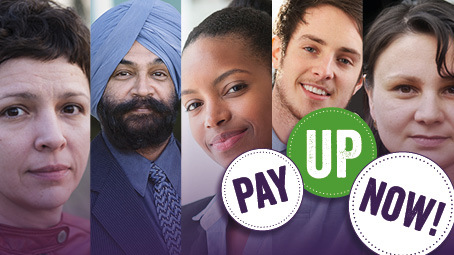 Poster advertising UNISON’s national pay campaign. 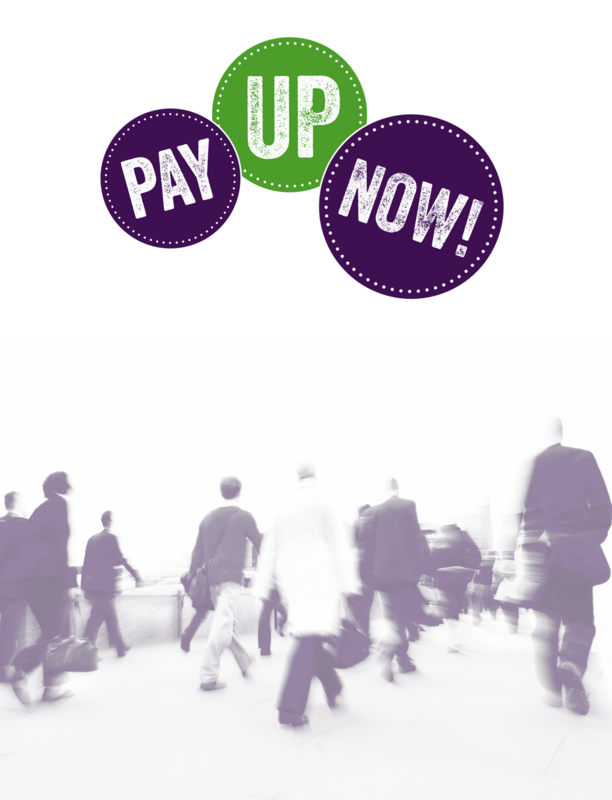 Leaflet to use to get member engagement in the union’s national pay campaign.